Meetings and seminars are all about exchanges, ideas, opinions, new approaches and objectives. And that works best when it’s far away from the daily routine and daily business. Wambacher Mühle is exactly the right place for occasions like these. 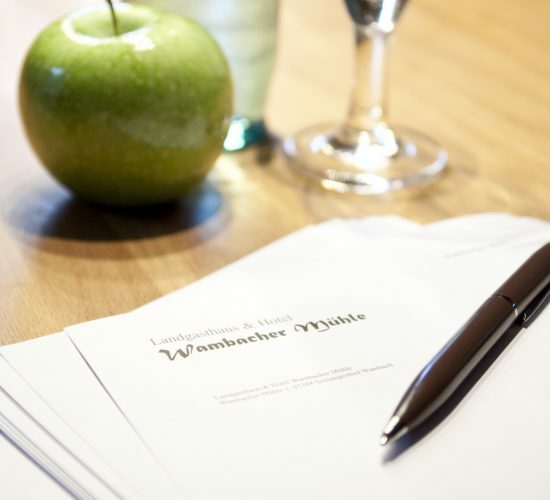 Our place is located in the beautiful Rheingau-Taunus district and just 30 minutes from Frankfurt Airport and 10 minutes from Wiesbaden. Its idyllic site is right on the edge of a forest with direct access to the feeder road B260. The crafts museum, the fully functional mill wheel, the barefoot path and the immediate vicinity to nature are both relaxing and inspiring. The location has three rooms for 20 to 60 people, a large terrace, and 11 lovely guest rooms and sufficient parking possibilities. We are looking forward to a personal meeting with you and will be glad to provide you with a non-binding offer.